Science, health and critical thinking for the masses. Pertussis (whooping cough) is a contagious respiratory disease characterized by uncontrollable, violent coughing which can make it difficult to breathe. The name “whooping cough” comes from the many deep breaths that are needed in order to regain the air that was missed after a fit of coughing. The disease can be fatal and infants less than 1 year of age are most vulnerable. The childhood vaccine for pertussis was known as DTP or DTwP (diphtheria, tetanus and pertussis). The ‘w’ stands for ‘whole cell.’ The whole cell pertussis vaccine was introduced in the US in the late 1940’s and significantly decreased the incidence of pertussis. 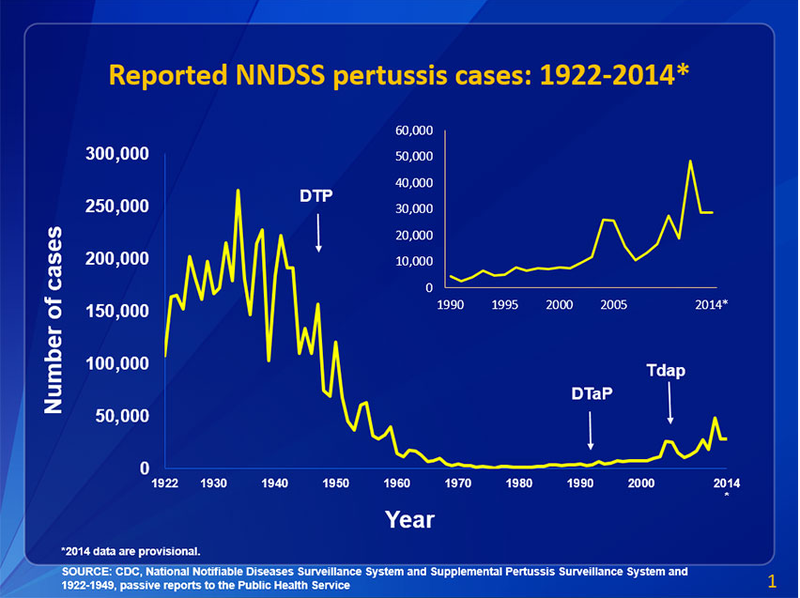 The decrease in pertussis incidence and the resulting lack of observable cases made many groups begin to question the use of the DTwP vaccine, especially given the concern over the adverse events. Several countries stopped administering the vaccine and as a result saw a resurgence of pertussis within five years. For example, Sweden ceased its pertussis immunizations in 1979 and incidence of the disease slowly increased. In 1981 there were 700 cases per 100,000 people and by 1985 that number had increased to 3,200 per 100,000. These events led researchers to attempt development of an acellular pertussis vaccine (DTaP) which was just as effective but without the adverse events associated with the whole cell vaccine. Researchers were successful in one aspect; the DTaP vaccine was associated with fewer adverse events. However, the DTaP vaccine was found to be not as effective as the DTwP vaccine. In addition, the immunity provided by this new DTaP vaccine wanes over time. For this reason, booster shots of Tdap vaccine are recommended. This vaccine is similar to DTaP but contains lower doses of the diphtheria and pertussis vaccines. Despite its lower effectiveness, there is still irrefutable evidence that the DTaP vaccine greatly reduces the risk of pertussis symptoms. Tdap immunization is recommended during pregnancy. A randomized clinical trial found no evidence of adverse events in mothers that were vaccinated and also provided newborns with a higher concentration of pertussis antibodies during the first 2 months of life, when the infant would otherwise be vulnerable. Outbreaks of whooping cough have been cropping up recently in Alberta, California, Michigan, and the list goes on. 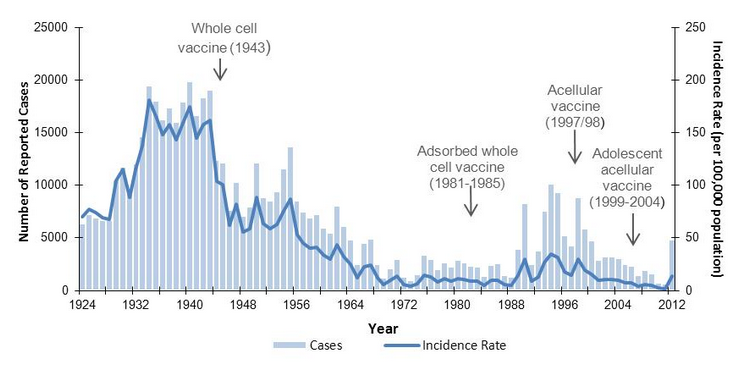 The rise in outbreaks is attributed to a decline in vaccination rates. For example, in an outbreak in Huron County, Ontario, most cases were found in unvaccinated individuals in a Mennonite community. The city of Nelson, British Columbia saw an outbreak of pertussis, where one third of parents refuse to vaccinate their children – the lowest vaccine compliance in the province. In Kanata, Ontario, a family of seven children all contracted the disease. Ironically, their parents had just changed their stance on vaccines and had already made doctor’s appointments for them to get vaccinated, but it was too late. The outbreaks of pertussis pose a real danger to infants too young to be vaccinated. The Facebook page Light for Riley was set up by parents of an infant named Riley who contracted whooping cough and passed away as a result of the disease. While the study provides a potential explanation for the outbreaks, it is still too early to be sure that this is happening because an effect observed in baboons may not necessarily be observed in humans. Until a study in humans is done, we won’t know for sure. Still, if true, it will be more important for people to get vaccinated because it will no longer be possible to rely on herd immunity. The most effective way to safeguard against the potentially lethal symptoms of pertussis is to get vaccinated. Given that young infants cannot be vaccinated, it is even more important for pregnant women to get vaccinated so that they can impart some protection to their children during this vulnerable stage of their infancy. It should come as no surprise that the pertussis vaccines have been a target of the anti-vaccine campaigners. One of the logical fallacies that is pervasive among anti-vaxxers is the nirvana fallacy (aka the “Perfect Solution” fallacy), which says that if an action is not 100% safe and/or effective then it is better to take no action at all. The problem here is that any examination of the benefits of said action are not even considered. This is essentially what happened with the whole cell pertussis vaccine; all of the adverse events of the vaccine were trumpeted by the anti-vaccine community while any consideration of the benefits was absent. “Because of the near-impossibility of having an honest discourse about vaccine side effects, there were few conversations about whether the advantages of the acellular pertussis vaccine outweighed its disadvantages — or even what those disadvantages were. The end result has been the widespread adoption of an acellular pertussis vaccine that, while effective, provides more rapidly waning immunity, and may possibly be ineffective at preventing transmission of the disease to unvaccinated individuals. Ironically, the nirvana fallacy then rears its ugly head once again among anti-vaxxers, who are now citing this lower efficacy as a reason to completely forego vaccination. The story of the pertussis vaccines underscores the need for more widespread teaching of critical thinking skills to the general public. And remember: vaccination for pertussis still protects against the potentially lethal symptoms of pertussis. Dismissing Anecdotes – Are Scientists Jerks? Mercury in Vaccines: Are We Really STILL Talking About This?